Nevada City Chamber of Commerce hosted an Arbor Day Walk Saturday March 11, 2017. California ReLeaf in conjunction with PG&E awarded the Tree Tour Map/Tour a grant earlier this month. Zeno Acton of Acton Arboriculture led the educational tour. Photo by Ken Teichmann. NEVADA CITY, Calif. March 13, 2016 – The Nevada City Chamber of Commerce hosted an Arbor Day Walk with Arborist Zeno Acton of Acton Arboriculture on Saturday, March 11 from 11am to noon. The event attracted walkers from local MeetUp and walking groups, as well Nevada City Mayor, Evans Phelps and Nevada City Chamber of Commerce Board member and President Mike Byrne. The Arbor Day walk was part of the effort to update Nevada City’s Walking Tree Tour map originally completed in 2008. The Nevada City Chamber of Commerce was awarded a pass-through grant by California ReLeaf in partnership with PG&E this month. PG&E Quality Assurance Auditor and Arborist John Glaz spoke briefly about tree planting considerations and took questions, reminding people to call 811 before digging for trees and also to consider utility lines above. California is facing a crisis in tree loss due to bark beetle infestation and drought conditions. Glaz suggested to participants that this is a good time to plant trees and add to California’s diverse forest. 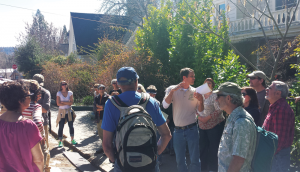 Arborist Zeno Acton spoke to identifying the right tree for the right location, and returned to this with specific recommendations throughout the informative Nevada City tour. The Tree Tour map is being updated using new technology. Once completed, the new map will let visitors walk the tour with their smartphone, navigating easily while reading about trees or view on their tablet and desktop computer. Go to https://www.gofundme.com/NCC-tree-tour to learn more and contribute to the Nevada City Walking Tree Tour map today.